June 13, 2016 marks the third anniversary of owning and driving a Model S from Tesla. I picked it up on a warm, bright afternoon in 2013 from the Grand avenue showroom in Chicago. I boarded a commuter train close to my North Shore suburban home just before noon and pulled into Union Station less than an hour later. Yes, I took a day off work. A short cab ride put me at the glass front door of the Tesla facility. I was beyond excited, but also a little apprehensive. I was about to transition from the familiar internal combustion vehicles into a vastly different world of transportation. Was I making a mistake? What if it would be a bust in a year, or even less? Man, that’s a lot of money for a car. A tiny voice in compartment deep inside my brain said, “leave now.” I didn’t. Almost everything about buying, owning and driving a car from Tesla is vastly different from any other car experience I have ever had. The entire buying process was done online, including selecting options, placing the down payment and electronically reviewing and signing all the necessary documents. Ok. The transaction details are all complete. All that’s left is to drive away. And drive away I did. Let’s just say that there is nothing like driving a Model S. I bought the 12,807th Model S off the Fremont, California assembly line. Because I was early on I got some things included that are now options; premium lighting, headliner fabric for starters. My dash has the wood grain going vertical. Soon after they changed it to horizontal. Small items for sure, but still, my Model S stands out. No I don’t have summon or autonomous driving. I really don’t care. I do wish I had 4-wheel drive, but I’m doing fine, even in the Chicago winters. Gas stations, oil changes, maintenance and worry are not in my vocabulary, having been replaced with miles of smiles. June 14 marks the day I picked-up my Model S in 2013. People often ask me if I still like the car? Have I had any problems? Would I buy another one? Yes, I still love my car. Everyday it is a joy to drive for all the reasons that have been expounded thousands of times over by Model S owners like me. The item that was somewhat concerning to me prior to owning one was the battery, or batteries in this case. Would it keep taking a charge quickly? Would it lose power or discharge faster over time? I have noticed nothing that would lead me believe that there has been any degradation in the battery at all. My car charges as fast as it every has, and I’ve charged it almost every day since I drove it home. It carries me reliably along the displayed range of miles and the acceleration still produces that wide Tesla grin. In short it has exceeded by durability test, at least so far. I do find it to be a big car and the turning radius is wide, which means you have to be careful in narrow parking ramps or in tight traffic spots. And no you can’t really have the same kind of fun if you wish to take a road trip, despite all those Superchargers and the recent installation of range anxiety features now built into to the software. But I’m a careful driver and I tend to get on a commercial jet liner for my trips, so I didn’t buy the Supercharger option. On the service side, here’s what I’ve had done. The windshield washer jets that squirt solvent on the windshield were aligned too low, not allowing the wipers to do a thorough job of cleaning. I took it into the Highland Park service center and they made an adjustment that fixed the problem. They also performed some minor service bulletin work related to minor creaking here and there. No charge. One day I returned home from work and plugged in car. There are lights that display around the car charging input plug to tell you the mode of the charge. Blue means preparing for charge, green means it’s charging normally and amber means there is a problem and the car is not charging. No matter how often I plugged and unplugged the cord or wiggled it around when in, the amber light would not go away. They sent a technician to my home the next morning who determined that I had a faulty power cord. He replaced it and I’ve had no problem since then. No charge. Chicago winters are harsh. Cold, ice and snow are frequent, so having a good windshield defroster is critical. I found the Model S was not doing a good job at diffusing the heat evenly across the width of the front glass. Same service center swapped out the deflector on the dash with one that had a different vent pattern. Problem solved, no charge. Lastly, I have heard that paying attention to tire rotation is important on the Model S. When I reached 6,000 miles I called the service center. They came to my place of work, picked-up the car, performed the rotation, cleaned the car and returned it before my work day was over. Again no charge. That’s the extent of my need for service. No cash outlay and no inconvenience. They either came to me or I went in when it fit my schedule. 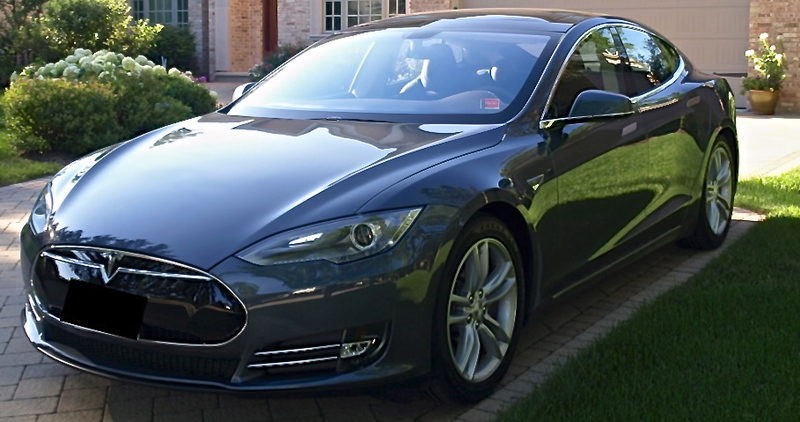 The Tesla Model S is not for everyone, but it is for me. If fits my aesthetic, my love of technology and design. It also feels good to support a company trying to do something completely different from everyone else in the car industry. Detroit, et. al. have no doubt been building tech into their cars for a while, but they user interface is a mess. They will learn from Tesla and improve their cars, not because they fear Tesla, but because they will realize that they can do better. 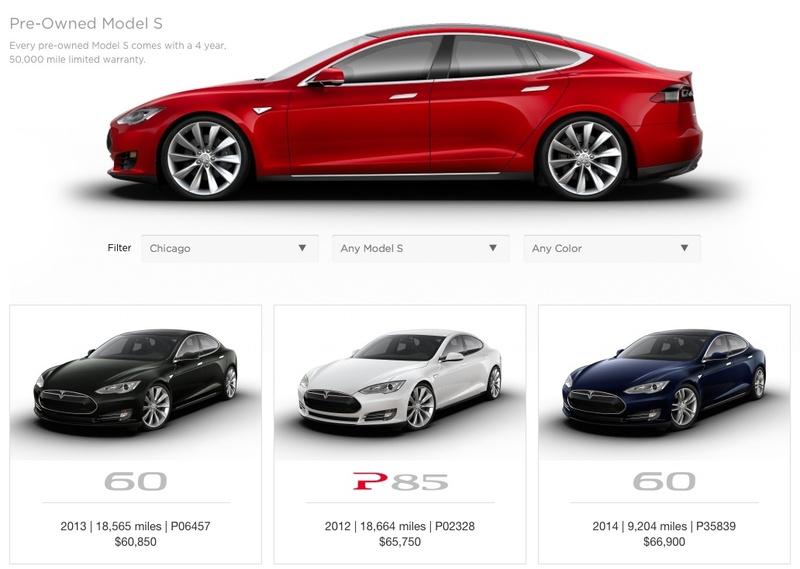 Tesla has launched a pre-owned sales web site which gives consumers the first ever centralized hub to shop for a used Model S. Mine is closing in on two years and there have been a number of updates and new features added over that time. I would be lying if I said I didn’t think about upgrading. Some owners are trading for the D while others will be coming to the end of their three year lease. It’s a smart move for Tesla. Their web site is beautiful as one would expect, with the cars neatly displayed in a grid with the key data including miles and price right up front. They are however, not photos of the actual cars. When you click in you see the exterior and interior choices that match the vehicle (presumably), but they are studio shots of new cars. You don’t get to see the character that cars acquire over time. You get the marketing copy and feature set that is seen when one orders new, but nothing about the condition of that specific car. Clearly I wouldn’t expect Tesla to actually open a used car lot, but what happens if you are not satisfied with your choice? Each car comes with a 4 year, 50,000 limited warranty and 24 hour roadside assistance, but also requires an immediate down payment that varies based on, well, something. Cars require a $1,500 transportation fee to get it to the nearest service center, and the prices are not a bargain. I assume you won’t be able to apply for the Federal tax break of $7,500, or for your State rebate program if they have one. Most of the cars in the Chicago area which was nicely filtered when I arrived at the site, were 85kWh or P85kWh models. Only two 60kWh were available when I looked, which is what I have. One was listed at $66,950 plus the $1,500 transportation fee = $68,450. My Model S all in with almost exactly the same options (I don’t have supercharging) was $81,020. Subtract the $11,750 in breaks and rebates and you get $69,270. The listed car has 9,204 miles, mine now has 9,978. Not really a bargain for me, but the options and prices have significantly changed since I ordered mine in 2013. This, along with the lack of PR at launch, tells me Tesla is testing the waters a bit, which is smart. 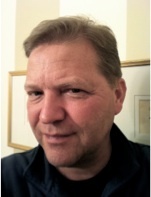 A car manufacturer (also the dealer) is in a unique position. The owner typically wants to move on but the product is still very much viable. They should look to monetize this and I applaud this important step. But if you are in the market for a Model S, I recommend you order a new one. It’s a keeper. I never get too excited or depressed about Tesla’s stock price. Stock analysts worry, and a lot. I can’t imagine how they ever sleep at night knowing that during those hours they are completely off the influence grid. Because Tesla went public it made a new bed and as a consequence, has at least two major challenges it must constantly consider. Disclaimer: I own a modest number of Tesla shares and have for years, but it’s not my retirement plan and never will be. For me the primary investment is the Mission of Tesla, which for now means the Model S. I’ve owned one since June 2013. The idea that someone would have the courage (and smarts) to start a car company from scratch and be able to differentiate it from all other automakers, as well as their products in every way, was extremely attractive to me. Others have tried, Tucker, DeLorean, but they were trying to compete with essentially the same formula. That rarely works out. In this case we have disruption and not the bullying kind which is what we often see in tech sector firms. I was nearly born in a car. My mother used to regal me with the story of how she just barely made it to the hospital. Five more minutes and I would have emerged while in the back seat of a 1954 Chevrolet Delray. Growing up I was surrounded by relatives who raced cars, worked on automobiles, both personal and commercial, and sold them to the public. I remember sitting in my Uncle’s Chevrolet sales room in Ohio while we were visiting one summer and seeing a sign that read, “A new Chevrolet is sold every minute.” Gasoline and oil ran through my veins and I inhaled more carbon monoxide helping my dad in the garage than was probably good for me. 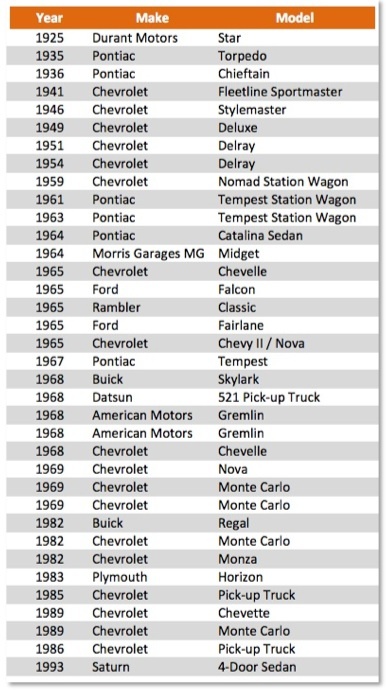 For the record, here’s a list of all the cars my father owned. I think it was all of them. The year column indicates when the car was manufactured, not when he purchased it. Yes, there’s a very big gap between 1969 and 1982. Completely unexplained. Maybe we both failed to make entries in the diary. Never mind, it’s more fun to call “slacker.” We lost my father to cancer in 1992. He would have been proud to say he preceded his latest car in death by a full year. I frequently imagine what it would be like to pull up in his driveway with my Model S and take him for a ride. As you can see, my father’s list is heavily weighted toward U.S. carmakers, especially General Motors.The recent stories about how GM covered up defective parts for decades was disturbing to me as someone who rode in, drove and owned them as an adult. The last time I owned a GM car was 1989. I switched because I couldn’t afford to pay the maintenance fees. When President John F. Kennedy challenged America to “land a man on the moon and return him safely” in 1961, it was the catalyst for a series of missions meticulously planned and executed by NASA. Most had doubts we could do it successfully. The ones who believed worked at NASA. 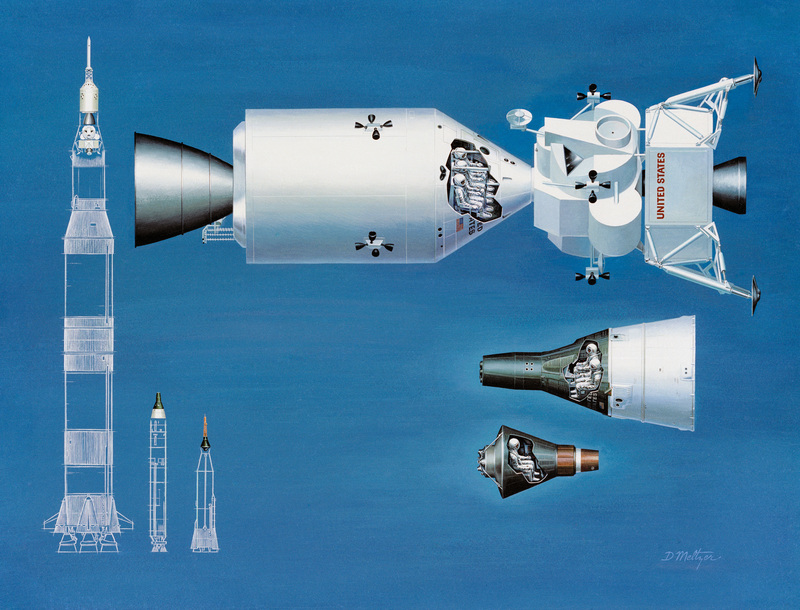 They developed a phased approach with three programs; Mercury, Gemini and Apollo. Mercury set out to successfully orbit the earth, study the ability to operate in space and recover both the astronaut and his craft. Gemini’s role was to study the effects of long term space missions on astronauts, perfect re-entry procedures and give astronauts extended practice time in a weightless environment. Once these were accomplished, the third program could begin. Apollo was about landing a man on the moon and returning him safely. I was enthralled with the space program growing up. I held my breath at every launch, was glued to the television for each mission and wondered what would come next. To accelerate the advent of sustainable transport by bringing compelling mass market electric cars to market as soon as possible. The cost of the three NASA programs is hard to pin down, but many sources say that Mercury cost about cost $277 million in 1965 dollars, Gemini cost $1.3 Billion in 1967 dollars and Apollo $20.4 Billion in 1970 dollars. Obviously these number increase greatly when you convert them to today’s dollars. These missions were a stunning achievement and brought innovative technology to the private sector in numerous ways. In other words, we all gained benefit from these programs. The point of quoting the cost figures is to bring perspective into the discussion. Today’s dollars always appear small when we look back a decade or two. The difference in these programs is that NASA was appropriated the funds from Congress, Tesla must navigate the murky waters of being a public company. Elon Musk’s release of all of Tesla’s patents was a courageous move. He realizes that no single car company can deliver enough electric vehicles to make a real difference in the planet’s climate. The intellectual property is out there. Others can choose to assist or ignore. BMW and Chevrolet have purchased, taken apart and reassembled the Model S in their war rooms. Why? Most likely to see how they can defeat Tesla. It’s a competitive game after all, including how Tesla sells its cars. A combined mission here, like the one NASA mounted would be an amazing feat of American collaborative engineering on a level never before achieved, this time on ground vehicles. Automakers coming together, including Tesla, could bring about a change much faster than we could even imagine. I know I’m describing a fantasy in the world of stocks and profits. Can Tesla really do it? Well, they landed the real estate for the Gigafactory. A great start. I believe it can be done and am pulling for them to succeed. Actually more than pulling for them. I drive the car and and am an ambassador for the brand everyday. I wish them success, not just to disrupt, but to innovate on a grand scale. To change history. A chance like that doesn’t come along all that often. 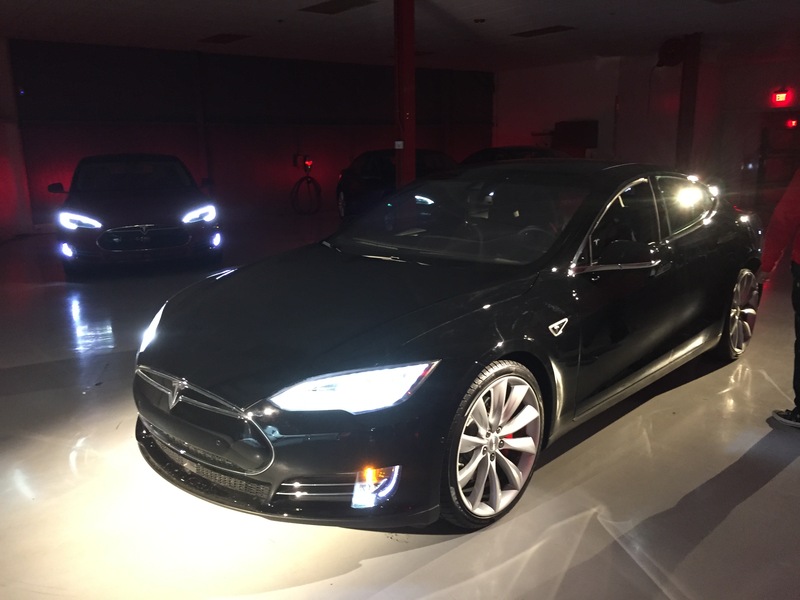 Is the Tesla P985 D Worth the Extra Cash? Ever since the announcement of the P85D last year, I have been bombarded with questions? Is it really that much faster? Will the autopilot work? Is it worth the extra money? 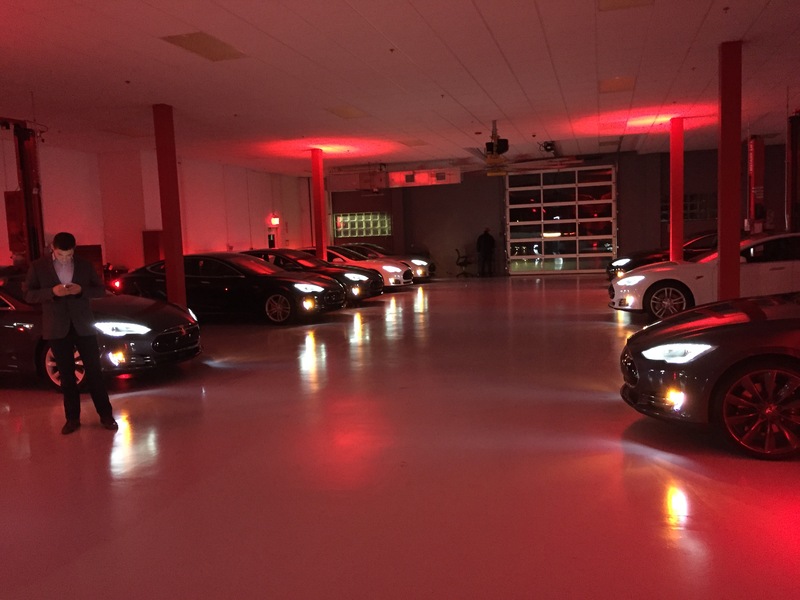 In December I had a chance to ride (not drive) in a P85D at a special event held in the Tesla Highland Park Service Center. It was a very nice event. Hors d’oeuvres wine and craft beer was available as well as four P85 D’s constantly going for test rides. I really love the Highland Park facility. They continually make updates to the building inside and out and the people who work there are super nice. I’ve gotten to know them pretty well over the last 19 months as I stop in for events or to simply chat. But back to the topic. I got into the front passenger seat and Dave, my driver, pointed to the settings on the screen and asked, “Do you want sport acceleration or insane?” Really? You’re asking me that question? Okay, how about insane. Dave smiled. It was one of those smiles you get when you’ve asked for something without knowing what you’ve asked for and the result will not be what you imagine, at all. He navigated to the on ramp, slowed to a stop and then pressed the accelerator all the way to the floor. Insane is a very good description. I wouldn’t call it acceleration. It’s more like escape velocity. You are pressed back against the seat and your stomach rises up into your throat. Telephone poles go by like they were part of a picket fence. It is truly a feeling of an “other world” car. My first reaction was wow, my second was, I could really get into trouble with this car. A Short Test Drive in a P85D. Yes it does bring a tear to your eye. Of course one can almost never use this type of power because we drive on roads where mere mortal cars roam and of course those pesky rules of the road. If having it for bragging rights is what you’re after, then you will always win that bar bet. The autopilot sensors were working, reading and displaying the speed limit signs on the center console; as if that mattered. The firmware for autopilot was not yet ready for production, so no deal on seeing how that worked. One of the most attractive things about the D announcement for me was the 4 wheel drive feature. I’m doing fine in the snow here, but all wheel drive would be a much more useful add on for me and many others as well I’m guessing. When Tesla announce the D they updated their Design Studio section on their site and offered the 60kWh battery with a 4 wheel drive option for $4,000 more. If that was available when I ordered my in early 2013, I would have jumped at it. Soon after they pulled that option for the 60kWh and now offer it only on the 85kWh and PkWh models. One other downside about the 4 wheel drive option is that it virtually eliminates the Frunk as a storage compartment. The new motor and all the technology and mechanics required to deliver it means you can probably put your brief case or backpack in the Frunk and that’s about all. I assume that will also be the deal when the Model X comes out with all wheel drive. 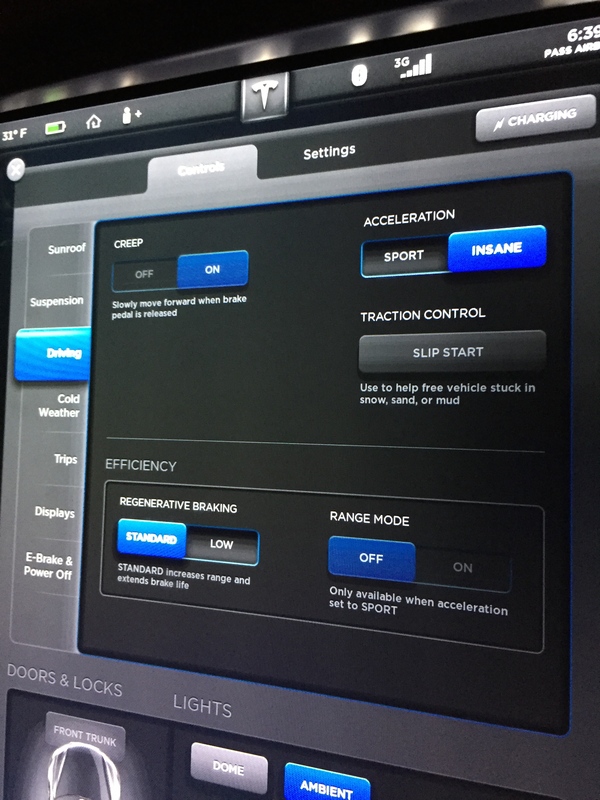 No one will be popping out of the Frunk on any demonstrations on cars with this options. For me, I can’t justify the extra money for a D. Tesla rates the D with a 253 mile battery range and the 85 at 270 miles. Early reports indicated that the D would be able to make adjustments in how the battery powers the car, and actually deliver more miles. This doesn’t seem to be the supported very strongly based on how Tesla specs out the cars. I would rather have more range with 4 wheel drive as a close second. It’s so hard to answer a question like “Is it worth it?” It’s always a personal choice. If it’s important to have speed and acceleration and you have the means, then go for it. It also might just might put some 85kWh and P85’s on the used market sooner, allowing new buyers to enjoy the experience. This is the second winter driving in my Model S. The last Chicago winter was the worst one in 40 years. I posted my experience last year about this time. Now for the follow-up. November was unseasonably cold, but December was actually quite nice. A number of 40 and 50 degree temps right up until the end of the year. We’re now in early January and the cold has hit us squarely between the eyes. Single digit temps during the day and sub-zero at night for the last week. Snow has not been much of an issue, but I’m sure it’s coming. So, how does it feel moving into winter number two? Am I dissuaded from owning my Model S? Fine questions indeed. Clearly one must adapt driving habits in the winter, but that’s true of any car. You don’t let your gas tank get too low in cold weather, so likewise, in a Model S, you watch the battery range much closer and take steps to reduce risk. My Kw/ml average exceed 820 this week. That’s well above the 300 I get during the other 9 months of the year and a little higher than I saw in last year’s Vortex weather. Since my daily commute is short this additional energy usage doesn’t impact me in the least. With my iPhone app I can start the heater of my car and warm up the cabin to a toasty 70° before I arrive at my car which I park in an open concrete parking structure. No issues with the door handle operation, any of the software processing or electronics. As far as driving snow, I continue to disable the regenerative braking feature which helps when the roads have yet to be plowed or I’m in a public parking lot. As with any car the best advice is slow down and be vigilant. Falling Gas Prices: Will This Impact Tesla’s Plans? Who would have thought that the Organization of the Petroleum Exporting Companies (OPEC) would suddenly become so irrelevant? 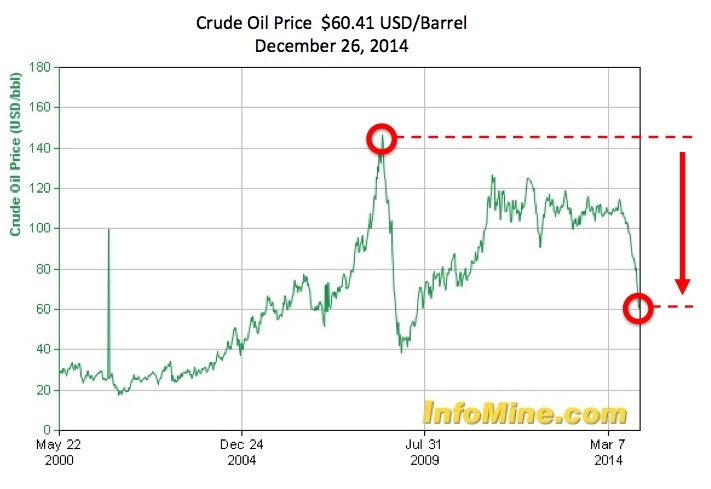 This powerful group controlled the production and price of a barrel of oil for decades and as you can see by the chart below they are under enormous economic pressure as well as, for the first time, significant competition for production. The United States, once so oil-dependent, is now emerging as one of the top producers of crude oil in the world. The price of a barrel of oil has fallen over half since July. As a result we have falling gas prices, which for most people is good news. Many of us are dependent on our cars to get us to work, school, run necessary errands, even take vacations. Gas has been a significant line item in the household budget. It’s now taking less of a bite out of that take home paycheck. One of the big attractions of an electric vehicle is the owner never needs to buy gas. It was indeed a big factor in my total cost of ownership spreadsheet analysis when I decided to purchase my Model S. So how will what we might call “cheap gas” impact Tesla’s plans and how do I feel about that as a Tesla owner? Tesla is more interested in eliminating carbon emissions, not necessarily saving people money at the pump. Their mission statement includes the following. Our goal when we created Tesla a decade ago was the same as it is today: to accelerate the advent of sustainable transport by bringing compelling mass market electric cars to market as soon as possible. Current Model S buyers are not cash constrained and don’t watch the pump price as they drive their current cars. The Tesla Model S and others on the drawing board is about a completely reimagined version of the automobile. Disruption of the old guard of car manufacturing and built in Silicon Valley. Clearly the Tesla Model S and the forthcoming Model X will only attract high end buyers. The success of these cars as well as the Gigafactory which will mass produce batteries at a much lower cost, are required before the Model 3 can become a reality. The Model 3 will be much more affordable and, if successful and in the target price zone car-buyers need, it will be the game-changer needed to propel electric vehicle adoption. 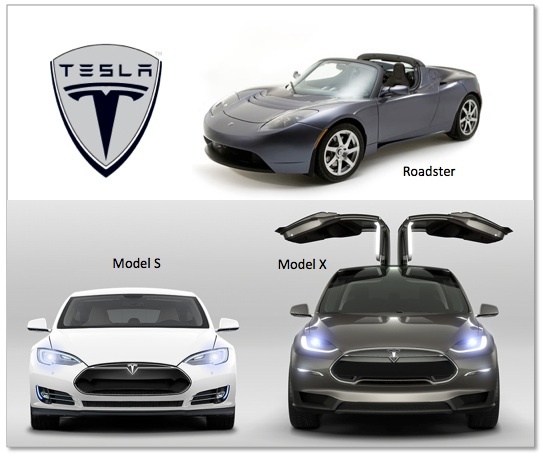 Tesla’s work means they are light years ahead of any typical gas car manufacturer when it comes to EV’s. No internal combustion car company could make the Tesla. It’s much harder to change than it is to start from scratch when it comes to innovation. That’s why Sears could never have become Amazon. They are simply not even on the same planet. The Tesla car is a design marvel and great design always wins. Think Apple over Microsoft. History has shown that when consumers can save at the pump they don’t automatically spend the difference somewhere else. It’s also important to remember that despite less money being spent on fuel, the cost of maintenance, both economic and in time remains unchanged. EV’s require little to no service. This change in gas price is so dramatic that I believe consumers who are right now looking at their 2015 budgets, might just entertain the concept of holding off to the side a fund for the Model 3. Do lower gas prices make my economic analysis less compelling today than when I did it two years ago? No question about it. But my buyer’s remorse matches my emissions output; zero.